Aubrey and Josh Hamilton seemed to have the perfect life. He was a med student at Vanderbilt and she was a grade school teacher. Newly married and very much in love, they’d known each other since they were children and knew everything about each other. One day, on their way to their friends bachelor party, Josh disappears, and Aubrey discovers she may not have know as much as she thought she did about her husband. The police look at Aubrey as the prime subject and her life goes into a tailspin. This synopsis was taken directly from Amazon.com. No One Knows is a very well crafted mystery novel. I loved how we were introduced to Aubrey the year her husband was declared officially dead. We were given tidbits of she and Josh’s story in flashbacks, as we watched her current self struggle through her life. The contrast between Aubrey’s fragility in the present to her strength in the past was the perfect smokescreen to the twists and turns of the plot. Aubrey had hidden depths, and her character had been through a lot more than appeared on the surface. I found her fascinating and really wanted to root for her, and in a way Josh. The story takes place in Nashville as all of her books do, and this time, they were living pretty close to my old neighborhood, so being able to picture the area really brought the story to life. Nashville always plays a lead character in her books, which appeals to me as a past resident, and is probably a big appeal to her fan base in Tennessee. I keep wondering when the characters will eat at the Pancake Pantry? This review doesn’t contain any spoilers, but I will say that there was a moment where the author (and Aubrey) made a decision that I did not agree with, and at that point my interest waned just slightly, making the ending a little anti climactic. As you’re reading you’ll know exactly which decision I’m talking about. Let me know if you agree, and did you feel like the author made the right choice with that character? Regardless, I really enjoyed this book. 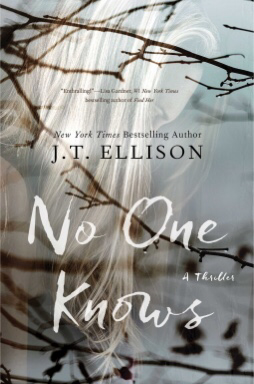 J. T. Ellison really knows how to craft a great mystery, and this novel did not disappointment. I received a copy of this book from the publisher, Gallery, through NetGalley, for my honest and unbiased review. I haven’t red this one yet but love her other books. You are right, Nashville plays a big part in her books and I love knowing the streets where they are driving. She actually had a murder take place on my friend Paula’s street in one book.